The lethal Ebola virus ravaging West Africa has forced the hand of Sierra Leonean President Ernest Bai Koroma, who issued a public health emergency declaration late Wednesday in an attempt to help stop the virus’ spread, the Associated Press reports. According to the news wire, Koroma promised that house-to-house searches would be conducted in order to find those who may have been exposed to the contagious virus, as well as to quarantine sick victims. Liberia is also increasing efforts to contain the virus, closing schools as well as telling most government employees to remain at home. Volunteers from the U.S. Peace Corps have been evacuated steadily, while two Peace Corps employees are currently quarantined outside the U.S. after being in contact with someone who died from the virus, according to a State Department official, AP reports. Ebola, which currently mostly affects Guinea, Sierra Leone and Liberia, has reportedly caused more than 600 deaths across the area, including those who have dedicated their lives to fighting the disease. Sierra Leone’s top doctor died earlier this week after treating hundreds of patients. 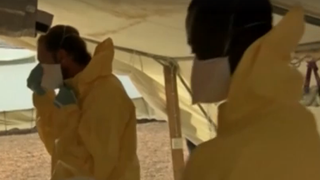 This outbreak has been dubbed one of the worst.